The Himalaya Program at UBC is organizing two public events on Nepal‘s recovery after the 2015 earthquakes: a public lecture on Friday evening, September 15, at UBC, and a community forum on Sunday afternoon, September 17, at Robson Square. Please note that the community forum will be in Nepali, so it’ll be of most interest to Nepali-speakers. If you’d like to attend either event, please RSVP via the Himalaya Program’s website (links below). The Himalaya Program invites you to attend two events this mid-September. There will be a lecture on September 15 and a community forum for discussion on September 17. 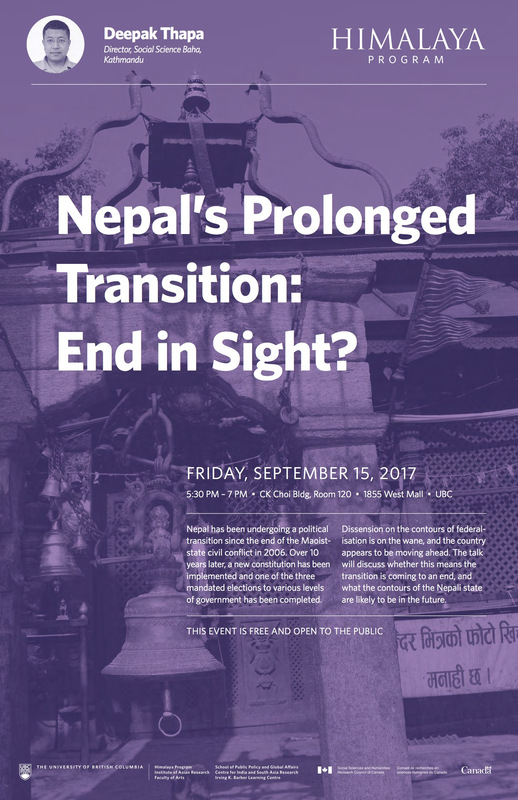 Lecture: Nepal‘s Prolonged Transition: End in Sight? Click here for the event listing on the Himalaya Program website. Please click here for a link to this poster in a larger size. Please RSVP for the event by clicking here. Click here for the event listing on our website. Click here for a link to this poster in a larger size. Join the Himalaya Program and NCSBC as we welcome a diverse set of visiting scholars for a discussion and Q&A about the various forces affecting Nepal‘s current governance, as well as the Nepali-speaking public’s perspectives and involvement. 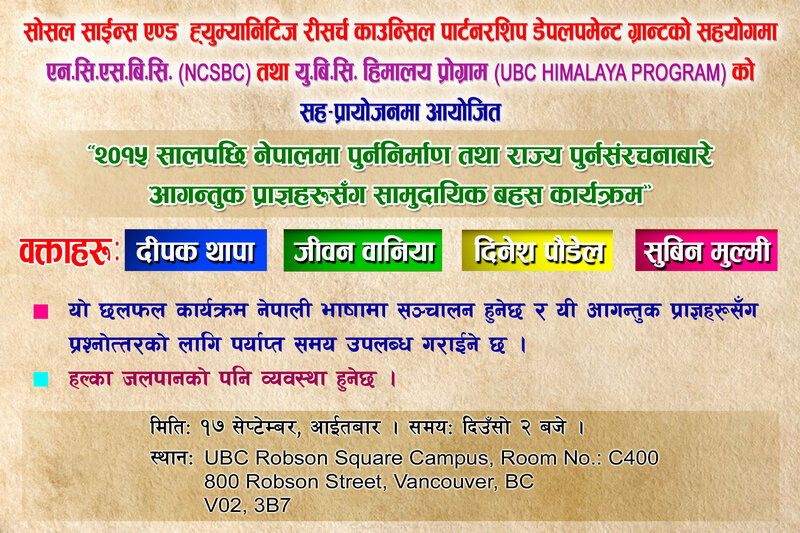 The four scholars are visiting from Nepal and the USA, and this discussion will be held in Nepali language. Please RSVP for the Community Forum here.